G文法 Introduction 1. The Semitish Languages in General 2. History if the Hebrew as a Living Language 3. Works on the Grammar of the Hebrew Language 4. Division and Arrangement of Grammar 5. The Consonants, Their Form and Names Part 1 of the Elements Chapter 1. Reading and Orthography 6. Pronunciation & Division of Consonants 7. The Vowels in General, Vowel-letters, and Vowel-signs. 8. The Vowel Signs. 9. Distinction of Qamats & Qamats-Hhatuph 10. Sheva Simple and Composite 11. Signs Which Affect the Pronunciation of the Consonants 12. Daghesh in General. - Daghesh Forte. 13. Daghesh Lene. 14. Mappiq and Raphe. 15. The Accents. 16. Maqqeph and Methegh 17. Qeri and Kethieh Chapter 2. Peculiarities and Changes of Letters; of Syllables, and the Tone 19. Changes of Consonants 20. Doubling of Consonants 21. Aspiration, and the Removal of it by Daghesh Lene 22. Peculiarities of the Gutturals 23. The Feeble Letters 24. Changes of the Feeble Letters 25. Unchangeable Vowels 26. Syllables, and their Influence on the Quantity of Vowels 27. Changes of Vowels, Especially in Reference to their Quantity 28. Rise of New Vowels and Syllables. 29. The Tone; Shifting of the Tone; and of the Pause. Part 2 Forms and Inflexions, or the Parts of Speech. 30. Roots and Stem Words. 31. Grammatical Structure 32. The Article 33. The Personal Pronoun in General 34. Verbal Suffixes. 35. Nominal Suffixes, or Possessive Pronouns. 36. Suffixes to Particles. 37. Other Pronouns. Chaper 2. The Verb. 38. General View 39. Ground Forms of the Verb; Conjugations. 42. The Regular Verb 43. Form and Signification. 44. 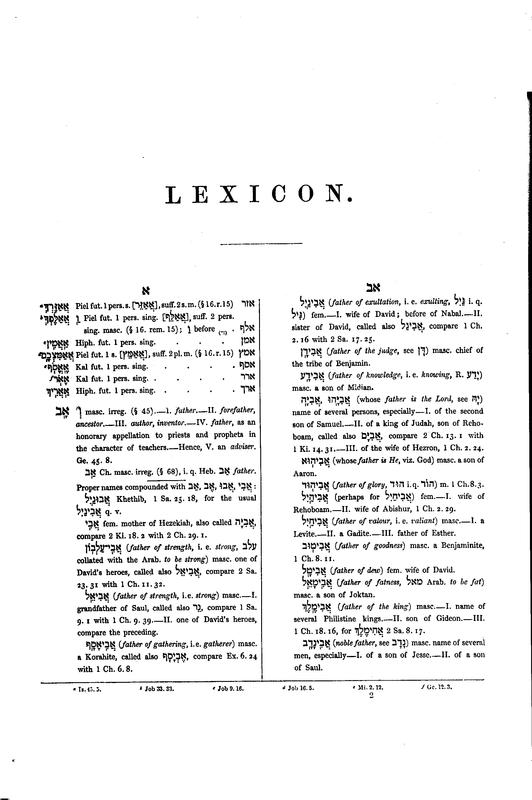 Praeter of Kal and its Inflexion. 45. The Infinitive. 46. The Imperative. 47. The Future and its Inflexion. 48. Peculiar Changes of the Future and Imperative. 49. The Participle. B. Derived Conjugations. 50. Niphal 51. Piel and Pual. 52. Hiphil and Hophal. 53. Hithpael. 54. Unusual Conjugations. 55. Quadriliterals. 56. Verbs with Gutturals. 57. Verbs Pe Guttural. 58. Verbs Ayin Guttural. 59. Verbs Lamedh Guttural. 60. Changes of the Verbal-forms Effected by the Suffixes. 61. Praeter with Suffixes. 62. Infinitive and Imperative with Suffixes. 63. Future with Suffixes 64. The Irregular Verb. General View. 75. Verb Doubly Anomalous 76. Relation of the Irregular Verbs to One Another. Biliteral Verbs. 77. Defective Verbs. Chapter 3. The Noun. 78. General View 79. Forms Which Mark the Gender of Nouns. 80. Derivation of Nouns. 81. Primitive Nouns. 82. Verbal Nouns in General 83. Nouns Derived From the Regular Verb. 84. Nouns Derived from the Irregular Verb. 85. Denominative Nouns. 86. The Dual and Plural 87. The Construct State. 88. The Nound with Suffixes. 89. Declension of Nouns. 90. Declension of Masculine Nouns. 91. Vowel Changes in the Formation of Feminine Nouns. 92. Declension of Feminine Nouns. 93. Paragogic Letters; He, Yodh, and Vav. 94. List of Irregular Nouns. 95. Numerals. -1. Cardinal Numbers. 96. Numerals. -2. Ordinal Numbers. Chapter 4. - The Particles. 97. Generl View. 98. Adverbs. 99. Prepositions. 100. Prefix Prepositions. 101. Prepositions with the Plural Form. 102. Conjunctions. 103. Interjections. Part 3. Syntax Chapter 1. Syntax of the Noun. 104. Relation of the Substantive to the Adjective; -of the Abstract to the Concrete. 105. Use of the Genders. 106. The Plural and Collective Nouns. 107. Use of the Article. 110. Connexion of the Substantive with the Adjective. 111. Apposition. 112. The Genitive. Expression of it by Circumlocution. 116. Use of the Accusative. 117. Modes of Expressing the Comparative And Superlative. 118. Syntax of the Numerals. Chapter 2. Syntax of the Pronoun. 119. Use of the PErsonal Pronoun. 120. The Demonstrative and Interrogative Pronouns. 121. Use of the Relative Pronoun. 122. Mode of Expressing those Pronouns for which the Hebrew has no Proper Forms. Chapter 3. Syntax of the Verb. 123. Use of the Tenses; General View. 124. Use of the Praeter. 125. Use of the Future. 126. Use of the Futurum Figuratum and Conversum. 127. The Inperative. 128. Use of the Infinitive Absolute. 129. Infinitive Construct. 130. Construction of the Inf. Constr. with the Genitive and the Accusative. 131. Use of the Participle. 132. Construction of the Participle. 133. The Optative. 134. Persons of the Verb. 135. Construction of the Verb with the Accusative. 136. Verbs Which Govern Two Accusatives. 137. Construction of Verbs with Prepositions. 138. Constructio Praegnans. 139. Construction of Two Verbs with One Another 140. Construction of Passive Verbs. Chapter 4. Connexion of the Subject with the Predicate. 141. Manner of Expressing the Copula. 142. Arrangement of the Parts of Speech in a Sentence; Case Absolute. 143. Relation of the Subject and Predicate in Respect to Gender and Number. 145. Constructions of the Compound Subject. Chapter 5. Use of the Particles. 147. The Adverbs. 148. Construction of Adverbs. 149. Words Which Express Negation. 150. Interrogative Words and Sentences. 151. The Prepositions. 152. The Conjunctions. 153. The Interjections. Paradigms of Verbs. Exercises in Hebrew Grammar Chrestomathy. Notes on the First Lessons in Translating.